Today I am going to review a book that I noticed on display at the library a couple of weeks ago. Yes…I was judging a book by the cover. It was too cute to leave on display. It had to come home with me. 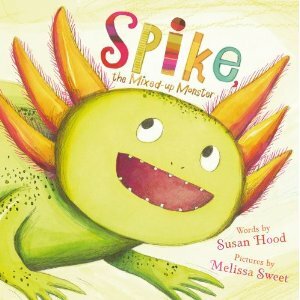 Synopsis: (from Susan Hood’s website) Spike was a monster. Or so he thought. He’d shake his spikes, swoosh his tail, and bare his teeth. But el pato, el armadillo and el campañol weren’t afraid. All they could do was laugh at Spike. Until one day a real monster appeared…. This book, about the power of kindness, is based on a real endangered Mexican salamander called an axolotl. It includes facts about the animals and a glossary of Spanish words. Lines From the Book: I usually include beginning lines in my reviews, but I wanted to show how Spanish is incorporated. Notice that Spanish words are italicized in the text of the book. One look, and the animals knew what to do. Only Spike was left to face el monsturo. Resources: This book provides a great opportunity to discuss endangered species and follow up with activities Discuss endangered species and then write Animal Poems (guidelines HERE). Find coloring pages for endangered species HERE. Online matching game for endangered species HERE. Learn more animal names in Spanish HERE and HERE. HERE is an online flashcard activity to learn animal names in Spanish. HERE is a recent article in New York Times about the plight of the axolotl. Why I Like This Book: This story is a delightful tale of friendship. I love that is has Spanish sprinkled throughout. Not only will kids enjoy the story, they will love learning the Spanish words. Also, at the back is a nonfiction section. It tells about the axolotl, which is an endangered salamander. Spike is an axolotl. The other animals in the book are featured in the nonfiction section, too. Then, there is a Spanish glossary to go along with the words in the book. I thought this was an exceptional format. And I can’t leave out the fact that Melissa Sweet is the illustrator. She brings the text to life with illustrations that are vibrant and beautiful! After all…it is the cover that caught my eye! ooh looks like a fun book! And that cover is cool! Penny, this sounds like fun!! My 4 yr old granddaughter already knows a few Spanish words from friends at church. I’ll have to see if I can find this one. Great! I’m sure she would enjoy it. It’s a cute story. Hi, Vivian! Glad you stopped by for my review. I was very excited to find this book. A lot of times the ones on display may catch my eye, but once I read them…I know ithey’re not a PPBF candidate. This…awesome! You had me at “Melissa Sweet.” Those illustrations are priceless. She is great, isn’t she? I love Balloons Over Broadway. One of my favorite books ever! What a fascinating combination of themes, from storyline to nonfiction to language. Great share! Thanks, Laura. It is a fascinating combination and she did it excellently! I read Kathy Temean’s review, too, and the picture of the actual salamander is adorable. I’m definitely putting this on my list. Thanks, Penny! This looks great, Penny! I love that it combines learning about endangered species with learning Spanish words – two for the price of one 🙂 Thanks so much for adding it to our list!!! “If you’re a monster and you know it, swoosh your tail…” Then it continues with “shake your spikes” in round two and “bare your teeth” in round 3. If you come up with lyrics to the Puff song, I’d love to hear them! Oo, there is so much to love about this book and I have to get my manos on it. Love all the activities and extras, Penny! Thanks, Joanna, And you may have noticed in the comments that the author and illustrator, Susan Hood and Melissa Sweet will have several activities soon.I will add the link when they get them completed. Great review and great resources to go with it. Thanks, Penny! Great review of this book — glad you chose it by its cover. Love the emphasis on endangered species and the sprinkling of Spanish words. Wonderful gift book. I love your review and this book! Thank you so much. I saw this title on the Cybils list, but didn’t know what to make for it. I love the story of friendship, the inclusion of spanish words, and that it has factual information too. I hope my library has it. Thanks for stopping by, Susan. Can’t wait to see the treats in the curriculum guide. 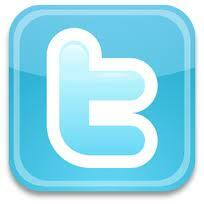 I have updated my post to include the article. Penny, thanks for recommending this book. I love that it has spanish words in the reading text and the illustration looks adorable. I think it will make a terrific read for my little ones. Thanks for reading my review, Catherine! Thanks, Cathy! That was a great interview and I love the trailer for Just Say Boo! Adorable. I read that interview too and can definitely see why the picture inspired her!